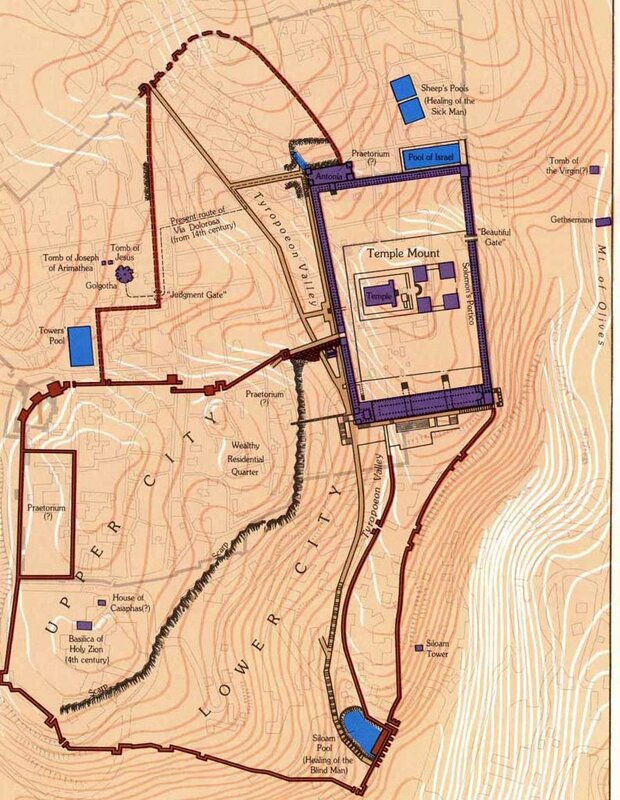 Because it was after dark and the gates of the Temple where they would have met were locked, certain members of the Sanhedrin, the scribes and elders, met in the southwest quarter of the city at the palace of the current high priest Caiaphas, whose name means “inquisitor.” Before this incident, Caiaphas had said about Jesus that it would be expedient that one man should die for the people. This was more prescient than Caiaphas could know. Trying Jesus was difficult because it was hard to find a solid charge that would stick as the witnesses that were brought forward could not agree. The Mosaic law required at least two witnesses to agree on a charge. While a number of challenges and charges were directed toward Jesus, he refused to answer. Without proven evidence, Jesus was not obligated legally to answer. Caiaphas knew this. Jesus not only answered affirmatively but added that he was the Son of Man who would “sit at the right hand of Power,” an Old Testament title for God’s vice-regent on earth — a peer as it were — of God. The high priest tore his garments, claiming he’d heard blasphemy in his presence. He asked the assembled members of the Sanhedrin, seated in a semicircle around him, for their judgment on that subject. 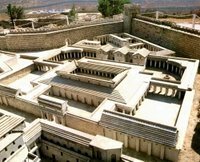 The vote would proceed from the youngest to the oldest members of the Sanhedrin, to prevent the elders from having an undue influence the younger members. The Temple police, who were under the jurisdiction of the Sanhedrin, then beat the prisoner, which was the standard operating procedure for the condemned. One problem remained for the Sanhedrin; night trials by the council were illegal except in monetary cases. Therefore, the full council would need to collect the next day again, shortly after dawn for a roll call vote. One last complication arose. To avoid dangerous and hasty convictions, the Jewish law postponed sentencing the condemned until the day following the trial. But this was illegal as the next day was the Sabbath when only acquittals could be returned for a prisoner. However, in light of the fact that this was an emergency situation, this was overlooked. This was unexpected. There would be no automatic approval of the Sanhedrin’s judgment. Instead, this was the beginning of the interragatio, the opening formula of a Roman examination. Pilate began to try Jesus himself Friday morning. It would be difficult for the Sanhedrin to explain to a “pagan” governor that Jesus had been judged guilty of blasphemy. That was a religious charge that would make no difference to a Roman. Instead, they put forward three specific charges that would appeal to the governor: subverting the nation, withholding tribute money due Emperor Tiberius Caesar, and claims of being King, i.e., Messiah (Greek: Christ). The first charge was serious but required specific proof, and Jesus in his teaching had avoided politics. The second charged Pilate knew full well to be a lie, as the Pharisees themselves protested paying the tax. Indeed, the Temple moneychangers converted Roman coinage to Temple currency. The third was the most consequential. It was maiestas, the familiar Latin term for high treason, the most horrendous according to Roman law (see earlier historical note on Pontius Pilate). After interrogating Jesus, Pilate could not get to the bottom of the truth. At this point, it was after dawn, and the crowds outside who were in the know were getting loud and unpleasant. When Pilate heard someone mention Jesus being from Galilee he saw an out; Herod Antipas, the ruler of Galilee, was in town. 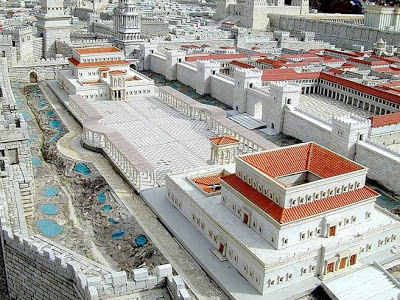 Pilate could easily and legally transfer the venue of this case from the forum delicti, the place of offense, to the forum domicilii, the place of residence. The Sanhedrin could expect a more favorable decision from Herod Antipas since he had aided them before in the affair of the votive shields. And Antipas was genuinely pleased to see Jesus, about whom he had heard much. However, Jesus would provide him with no sport. Although he appreciated that Pilate had granted him this boon, he could not afford the unpopularity of putting to death another prophet after killing John the Baptist. So after allowing his troops to give Jesus a gorgeous robe and then mock him, he sent the accused back to Pilate. The gospel writers tell us that after this Antipas showed his gratefulness to Pilate in friendship. Jesus was returned to Pilate at Herod’s Palace. 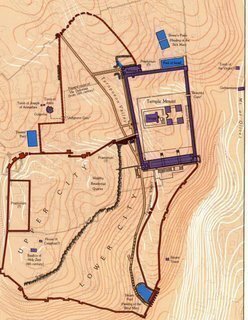 However, some believe that Pilate was at the Fortress Antonia, situated at the northern edge of the Temple. The tradition of the Stations of the Cross features the Antonia as the first site on the Via Dolorosa on the northern side of the Temple. At this point, the gospel of St. John tells us, Pilate took the initiative and suggested flogging Jesus as an object lesson and then releasing him. This Roman practice of fustigatio was to warn against further wrongdoing. Flogging alone was unsatisfactory to the Sanhedrin, who feared Pilate would equivocate and release the prisoner. In the final hour, they pulled out their trump card, the ace up the sleeve. This was the key that would link the religious and political issues. Pilate’s status as amici Caesaris or “friend of Caesar” was in danger. His political career would be over, if not his life as well. He had already been warned once directly by Emperor Tiberius already. Pilate then passed sentence against this “king of the Jews”: constructive treason – implied maiestas. Great work! I’ve heard the passion in the gospels read many times, and heard explanations of various details, but I did not know just how it all fitted together. You cite Maier’s book, but it’s not clear whether this blog post is an extract, or a summary? Stephen, where I cite “from Paul L. Maier’s In the Fullness of Time” it is an extract. In other places I cite “In part from Paul L. Maier’s In the Fullness of Time” then I have added content around the extract(s). its a great work you did about crucification specily trial of jesus but it will be more well if the 6times trail one by one from the gospels with chepters and verces.but i says again it is a great work. made that have answered some of my questions. Blessings. Bill, If you do not mind telling us what is your source for “The Oath of the Covenant.” Also is what is cited by Caiaphas the short version of the oath and if so do you know where I could find the full version? The Mishnah, a redaction of the rabbinic oral traditions of the Jews, discusses kinds of oaths under Tractate Shevuot, Chapter 3. For more on how the Sanhedrin conducted cross-examinations in civil and criminal cases, consult Mishnah Sanhedrin Chapter 4 and 5.